On Sunday, June 5, a group of 17 AmeriCorps volunteers from the Greater Grand Rapids Area American Red Cross arrived in Marquette to help with a variety of projects on the trail. Monday morning three different groups went to work. 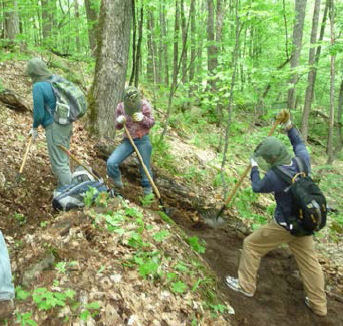 One group worked Monday through Thursday, at the McCormick Wilderness segment and into Segment 25 where they cleared a slew (over 65) of blowdowns, lopped and raked the trail. Remember that no power tools are allowed in the Wilderness, so all their efforts were executed with hand tools - crosscut saws, loppers and rakes. 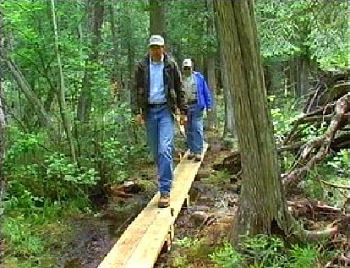 A second group met in Ishpeming and headed north to build new trail on the west side of the Mulligan Plains up a steep hill. A series of switchbacks were built including sections of benching the trail and adding rock steps. Four full days of physical exertion added slightly less than a mile of new blue-blazed trail up the hill for a rise of over 330 feet in elevation. The third group headed out to Sigan Road in Alger County to do some heavy lopping, general trail maintenance and blazing. Just getting in and out of that work site via Sigan Road from Sand River Road was an adventure the AmeriCorps probably won’t forget for a while. This group also worked at Wetmore Pond, removing the old boardwalks and replacing them with all new materials on the Old Growth Trail. A couple of reroutes and shorter boardwalks were also tackled on the west trail. Swamping through the muck paid off when the completed project could be easily hiked without fear of falling through a broken board. Note that Plum Creek Timber Company donated all building materials for the Wetmore Pond project. A subgroup also repaired handrails, added a step to some stairs and did a small reroute on the Wetmore Landing segment on the east side of County Rd 550.